Greetings, blog readers! 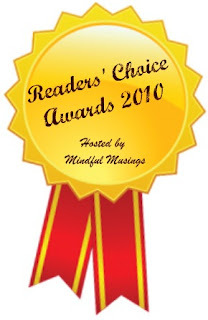 I was extremely flattered to see that I have been nominated for the "Best New Blog 2010" category for the Readers' Choice Awards 2010, which are hosted by Natalie of Mindful Musings. If you'd like, feel free and stop by and vote for me. Yet regardless of who you vote for, be sure to stop by this page, because there are tons and tons of awesome blogs who have been nominated for awards. To vote, just click on the graphic above. Thank you again for the nomination. I look forward to seeing which of the many blogs nominated takes home the award!